In this series, “Promises of Scripture,” we asked Youth Ministers one simple question: “What is a scriptural promise that you burn to communicate to your students?” Read the last article in the series here. If you were to eavesdrop on my conversations with my students, you would overhear a lot of promises of scripture. I want my kids to be saturated in the Word and to hear over and over again what God has declared to be true about them, the world, and Himself. But out of all the promises of the Word, Matthew 12:20 is the one I quote most often. Why is this promise of scripture so essential for my students to know? Why do I teach and repeat and say over and over again: “a bruised reed He does not break and a smoldering wick He does not put out?” It seems like a rather obscure promise to cling to, a snippet of a verse from Matthew that is simply commentary on Jesus’ earthly ministry. Why this promise? Because we believe that God is good but we don’t always believe He is kind. Thousands of things happen in every student’s life that cause them to question the kindness of God. Parents get divorced. Friends abandon them. Cancer steals lives. Hopes are crushed. Dreams are delayed. Suffering inevitably enters their world and suddenly the gentle kindness of the Lord seems like a naïve wish, rather than a Biblical reality. A student accosted me a few weeks ago after school because I had encouraged her to receive a gift from a friend without protest or fight. We began a conversation about how to receive things from God the Father, and how difficult that can be. She was adamant that she knew how to accept God’s love and receive grace from Him. The more we talked, the more she began to expose her theology of suffering. God would do what was good, she mentioned, but it would only ever be eternal good. Because of the suffering she had already experienced in her short life, she expected nothing on earth but pain and heartache and disappointment. When it came down to it, she felt like she deserved these difficult things in her life as punishment, because she was too stupid and selfish to learn her lesson any other way. That student needs Matthew 12:20. While the Lord disciplines those He loves (Hebrews 12:6) and prunes His branches (us) like a master gardener, He is not cruel. He allows bruising, but not crushing. He allows suffering, but brings compassion – He does not willingly afflict His children (Lamentations 3:32-33). The whisper of the serpent in the garden to Eve was “is God really good? Does He have your best interests at heart?” and the question remains for us as well. In reaction to the “name it, claim it” attitude of the prosperity gospel we can in a way, over-emphasize the eternal goodness of God. He will do what is ultimately good, right? We want our students to see that Jesus isn’t merely a ticket to the good life, rather He is the good life (John 17:3). We want our students to have an eternal perspective and not a temporary one. We want them to see Jesus as the treasure, the pearl of great price. These things are biblically right and true. But unwittingly in doing so, we often hold out to them a picture of God that is theologically accurate but incomplete. The heart of God the Father is not cruel or evil. He is not just ultimately good: He is kind here and now. No, He doesn’t always do what we want. He doesn’t always give us what we expect, hope for, or even ask for. His thoughts are not our thoughts and His ways are not our ways (Isaiah 55.8). But dear youth minister, He is not mean. Matthew 20:12 is a quote from Isaiah 42, about Yahweh’s chosen servant who will one day come. Later on in Isaiah, the prophet speaks about this servant and says “But he was pierced for our transgressions; he was crushed for our iniquities; upon him was the chastisement that brought us peace, and with his wounds we are healed.” On the cross, Jesus was not just bruised, but crushed; His life not just brought to a smolder but completely extinguished. In His life and death, Jesus took the punishment we – like my student mentioned earlier – fear, so we can receive full adoption as beloved sons (Romans 8:15). He took the wrath we deserve so that instead we are rejoiced over and delighted in as children of God. At the end of the day this is a promise I want my students to know because it’s a promise I need to know. When looking at suffering in their lives or in my life, when the awareness of my brokenness and the brokenness of the world threatens to overwhelm, I need to be reminded that while God may allow bruising, He will never, ever, ever crush. I need to be reminded that He knows my frame and is not cruel in His dealings with His beloved children, even when it may feel like it. Let us look to the cross and see a faithful Brother who suffered for us, a faithful Father who has compassion on us, and a faithful Friend who will walk with us at every moment. God is kind indeed. Join us for Rooted 2016, an intimate youth ministry conference, where we will explore the good news that God’s grace is sufficient for our relationships: with ourselves, with others, with the world, and with God. Jesus is our reconciliation yesterday, today, and forever. 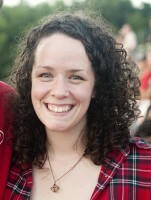 Sarah lives in Macon, Georgia where she is a high school Bible teacher at First Presbyterian Day School. She graduated from Columbia International University with a BA in Bible and Youth Ministry and an MA in Bible Teaching.